This is the standard sized hair styler from GHD. The GHD MK4 hair straightener is the most advanced hair straightener available. The GHD Original straighteners have been developed over the last eight years to become the best hair straightener on the market today. The GHD MK4 straighteners have a new, improved, rounder barrel for better styling while electronic temperature control offers the best straightening ever. Automatic multi-voltage means that the GHD MK4 can now be used anywhere. If you're forgetful the new sleep mode turns the straighteners off for you. Protection against damaged caused by condesation is offered by the latest Shiver Mode at temperatures below 5 degrees. Official GHD straighteners are covered by a full 12 months manufactures guarantee. You should register your new GHD stylers online as soon as you receive them to extend this guarantee to two years. 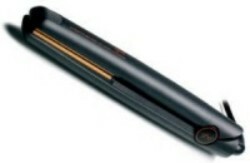 Check availability and compare prices of the GHD MK4 styler below.